What could be more artistic than southwest gardens personally designed by you? The southwest is a region of the U.S. with a riot of iconic colors everywhere. There are several tips and tricks to design a successful southwest garden you will enjoy for a long time and will add value to your property. Color coordination is a big issue for gardeners. A bit of personal preference comes into play in color choices for plants and design. One consideration is whether you prefer contrasting or coordinating color schemes. If you choose a contrasting color scheme, begin by making sure you include colors most prominent in your local surroundings. Blend your garden layout design so it meets the type of color contrast that grabs immediate attention. To create an artistic coordinating color scheme for southwest gardens, choose darker colors as a base that grows upward to lighter colors. For instance, you might choose moisture retaining succulents in a deep shade of green or low growing cacti as a base for more colorful plants like lantana, cereus cactus with yellow and white blooms or the eye-catching Guayacan plant with its purple flowers and muted green leaves. Secondary to color schemes for southwest gardens is regional climate. For example, in regions where temperatures are high for most of the day and cooler at night, the plants you choose should be specifically tolerant to these temperatures variations. Speaking of regional gardening, is your lawn ready for spring? Check out these tips to make sure you’re ready to thrive! If watering is a problem, there are many cacti plants that require little or no watering and will produce colorful blooms in unusual shapes such as the Mexican Hat Plant. In extreme drought southwest areas, plant Apache Plume with its sprays of tiny white flowers popping out of sprays of green foliage. 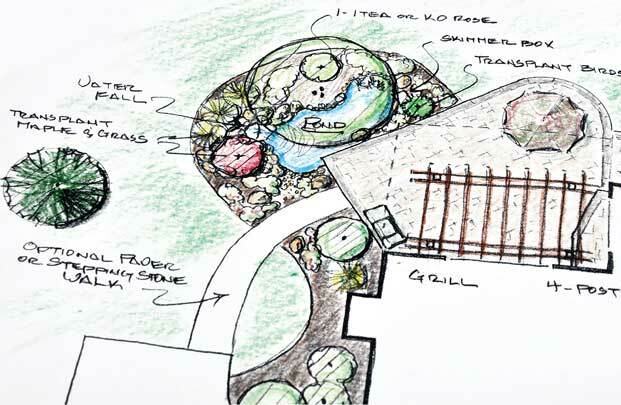 The design layout for gardens is similar to creating a blueprint of the size, shape, location, and style of a southwest garden. The trick with any garden design layout is in balance. The size, shape, location, and style of the garden should balance with the types of plants the garden produces. For small spaces, consider a container garden with a geometric design. This works well along sidewalks and in small patio corners. The containers should be color coordinated with the plants that will grow in them. Spend a little time shopping for containers with a southwestern motif or choose adobe or clay to add brightly colored plants. Here is a trick for gardeners who want to repurpose an old chiminea. Fill the chiminea with soil. Plant a tall, spiky cactus-like Desert Spoon at the back and then fill the front section with a small bank of Blackfoot Daisies. Before you toss out a short, thick tree stump, use it for an unusual plant container. Hollow out a hole about 4″ in diameter and 4″ deep, in the center using a sculptor’s chisel. Fill lightly with enough soil to allow plants to take root. Plant cactus or colorful flowering annuals or bulb plants in the. Place this “recycled” plant container where it will surely be a conversation piece. Check out the essential gardening tools you need to start your gardening journey.